If you are looking for a new career, new prospects or just a new challenge then why not train to become a Driving Instructor? 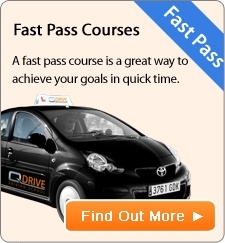 QDrive can provide you with all the training you require to work as a Qualified Driving Instructor. We have market leading experience in Instructor training and as a result offer the best Driving Instructor Training courses. Train with QDrive Driving School, Birmingham, your local driving school, familiar with the local areas surrounding Birmingham. At QDrive you get the best of the best from Area knowledge to Subject knowledge. Whether it's a full training course, Part 2 or Part 3 only or a Rescue Recovery Training Course, or even a Check Test, we cater for the individual going that extra mile to help you achieve your goal. Our training is on a 1 to 1 basis. You have the Instructor Trainer's full undivided attention to yourself. With our unique training methods we are best placed to train you in and around the Birmingham area. Our training courses are tailor made to fit in with your lifestyle. Whatever your commitments we do our utmost to accommodate your needs. If you only have evenings available then that's how we structure your training package. If you are only available on a Sunday then that's what you get. With our personal service, you get the best value from your training and a very high chance of passing the Instructor Training Qualifying Exams. Our pass rates are at least double the national average. There are also another 7,600 potential driving instructors training on a trainee licence. The table below shows the national pass rate for the ADI part one, two and three tests for April, May and June 2010. This table shows the total number of tests taken. Therefore a staggering amount of applicants fail even at the first stage. Of those who go through to part 2 only around half actually pass. Out of the remaining candidates only 3 out of 10 pass. This shows the lack of preparation people have before taking a test. The training is underestimated. At QDrive we understand all this and believe our 1 to1 training focuses on areas larger establishments don't have time to concentrate on as they often have training on a 2 to 1 basis and sometimes even 3 to1. To find out more contact us today to see how you can become better prepared for a career in the ADI industry.